Just who was it that developed the secret of oil painting? How did they invent the medium that produces such vibrant colors and fine detail, and can survive the ravages of centuries? The 'Secrets of the Masters' is a debate that has raged for centuries. Scholars arguing over the methods and materials of the Masters can be a tedious affair fraught with contradictions. But, as the Creationists say: Never let the truth get in the way of a good yarn. Like medieval monks spending a decade debating how many angels could fit on the head of a pin, it can end up sounding like meaningless bone-picking to the average layman. But there are some great stories around it. Equally, the story of the spread of this new medium from the Netherlands to Italy is just as full of doubt and hearsay. No lesser than Vasari claims that there was a friendship between Van Eyck and Antonello da Messina which explains the introduction of oil painting to Italy, but as Eastlake later pointed out, this is improbable as Van Eyck died in 1441 and "the earliest genuine date seen on pictures by Antonello is 1465. That reminded me of the Monty Python sketch where Michael Palin claims he wrote all Shakespeare's plays, but John Cleese points out that Shakespeare died 300 years before Palin was born. "Ah well," replies Palin, "this is where my claim falls to the ground." That Antonello visited the Netherlands and was entranced by what he saw is not in doubt. Vasari says that when he first saw a painting by Van Eyck in Naples, he was “so strongly impressed by the liveliness of the colors and by the beauty and harmony of that painting” that he dropped his tools, picked up his shirt-tails and ran off to Flanders. However, the painter from Messina was struck with a deep homesickness that drove him back to Italy. He is known to have fled the Netherlands and settled in Venice around 1475, where, Kugler tells us, "the sight of his new method produced a revolution." An example of Antonello's new formula in action. The detail is superb. Imagine for a second what it must have been like to be Giovanni Bellini: You're desperate to prove yourself and get out from the shadow of your father Jacopo and your brother-in-law Andrea Mantegna. Two colossal names in Art, and little old you in the background. Then along comes Antonello back from swanning around Europe with Van Eyck, bragging about some secret he learned. Now if only you could only get your hands on that formula. 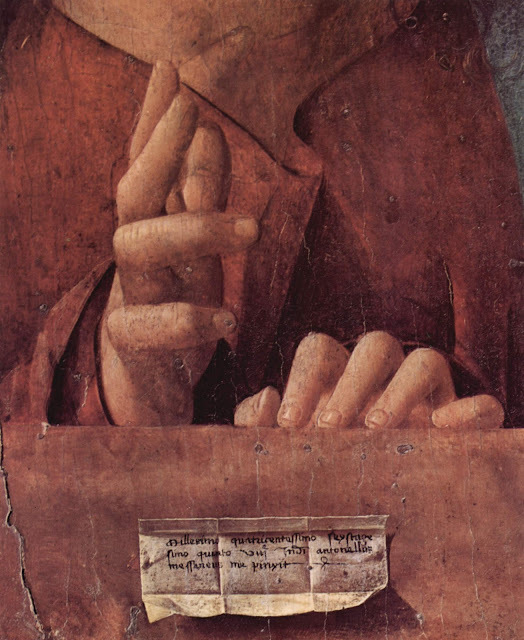 "In 1452 Venice was in a great furor over the arrival of Antonello da Messina, who had already been preceded by his tremendous reputation. Never before had such painting been seen - so brilliant and with tones so harmoniously blended. "One day a nobleman of great elegance, and purporting to have arrived from Padua but three days before, presented himself to the painter to have his portrait painted. The price was fixed at twenty ducats and the appointment made for the next day. "The young man followed the work of the master with great curiosity, although as he said, he had never been interested in art. The following day the stranger presented himself as on the day before. The sitting had already begun when a young girl, who posed as a model for the leading Viennese painters, came and knocked at Antonello's door. He sent word to remind her that the appointment had been for the evening and not for the morning. The model however replied that he must examine her then or not at all. "Antonello went grumbling into the next room, begging the young nobleman to excuse him, which the latter did with the most gracious air imaginable. "But he had hardly closed the door behind him, when the stranger made one bound from his chair to the bottle, which contained the precious elixir, and filled from its contents, a small flagon, doubtless prepared for that purpose; then replacing the bottle on its table, he resumed his place and his accustomed pose so naturally that Antonello, on returning five minutes later, found him as he had left him." The young man was, of course, no other than Giovanni Bellini. Was the story true? Who cares. This is one of my favorite paintings of all time (and is a real treat to visit at the Frick in New York). 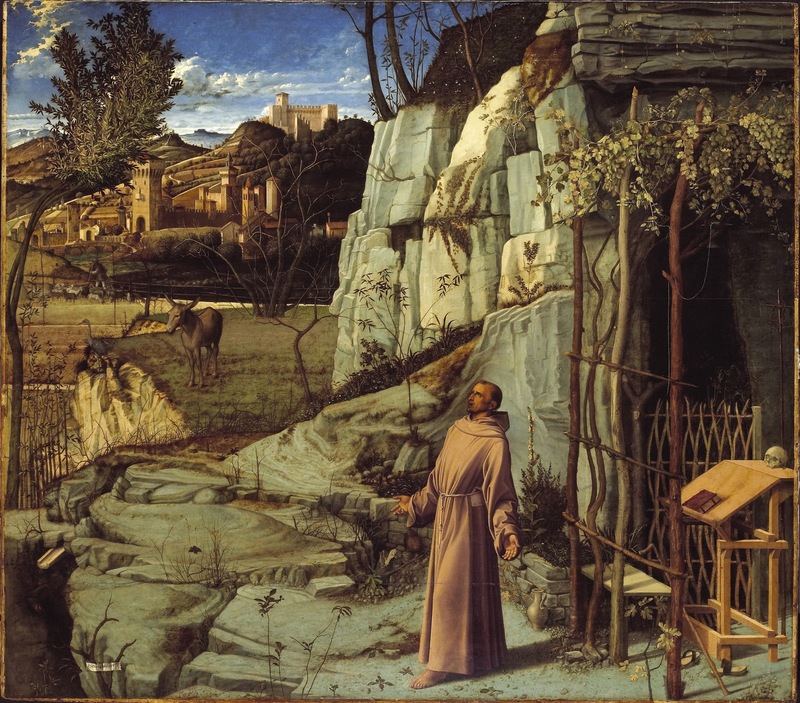 St. Francis' moment of clarity is practically hallucinogenic in the hands of Bellini. It's as if the Universe froze for an instant. Round one to Bellini. Still, history weighed in and picked the winner: Vasari referred to Bellini's "arid, crude and labored style." 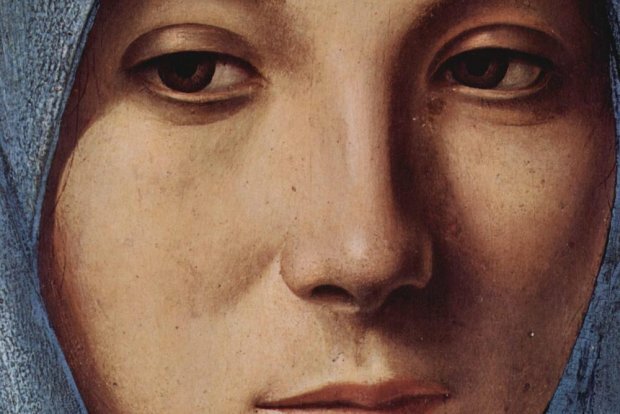 "Giovanni Bellini's reputation recovered only slowly from Giorgio Vasari's verdict," whereas "Antonello da Messina became an artist of legendary proportions during the Nineteenth Century" [Bätschmann], and became exalted on a level with the best painters from Northern Europe. 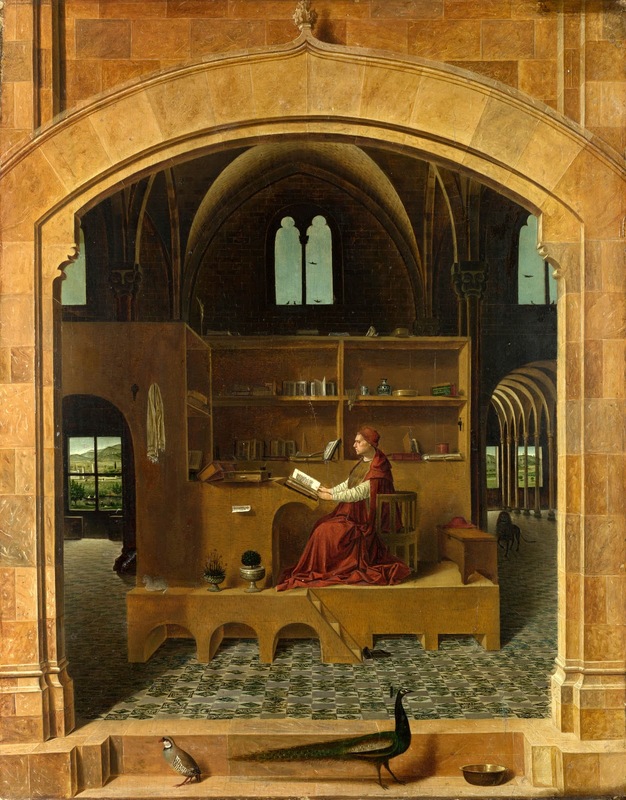 "Antonello's (St. Jerome) possesses a harmony and geometric clarity of structure that even Jan van Eyck could not match." High praise indeed from Keith Christiansen. to experience painting as an extension of reality." Okay, but what exactly was this secret medium of Antonello's? You think I'm just going to give it away for free? Look for an upcoming post where I lay it out in detail, for free. You've become quite the art historian lately! 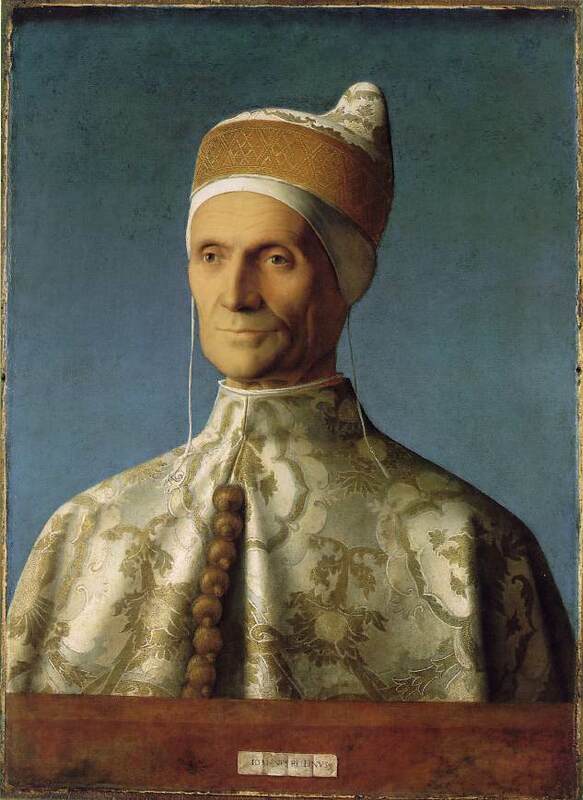 I love the stories and Bellini's Doge sends me into orbit. Can't wait for second installment. I love the Doge portrait. It's almost as if the head was an afterthought, like he was more interested in showing off how well he could paint fabric and then just popped a head on top. i had a teacher who looked just like that Doge. but he didn't dress nearly as well. thanks for the ripping yarn, alan. nice pictures, too! May the next round begin! Great work. I love the portrait. As we all know, if one choose to be an art student focused on oil painting, there will be a hard way which is hardly to undergo in front of him or her. Many art students set out their career from painting lots of oil painting reproduction and their reproduction will be art paintings for sale in galleries. where is the follow up article? This is one of your best posts Alan! I would love to wander in Italy more often than I do, but, no longer a rite of passage; it is a financial commitment to even consider going!